Media and Contents: Soft cover, 224 pp. plus double-sided, double A3 width fold out drawings and covers. Advantages: A great one-stop reference for the modeller; well structured; useful walkaround photos taken with the modeller in mind; attractive profiles; high standard of modelling and analysis of available kits; excellent scale and scrap drawings in 1/48 scale plus wartime manual illustrations pointing out important distinguishing features. Lynn Ritger will be well known to many HyperScale visitors as a Messerschmitt Bf 109 expert and the webmaster of the "109 Lair" website. SAM Publications has now released Lynn's second book, The Messerschmitt Bf 109 Part 2: 'F' to 'K' Variants. This is the tenth Modellers Datafile offered by SAM Publications, and its modeller-friendly format will be familiar to those who have purchased other titles in the series. The book comprises 224 pages plus double-sided, double A3 width fold out drawings between its glossy red covers. Text commences with a handy Glossary of Terms, followed by a short Introduction highlighting the human aspects of the air war. Chapter One describes type development, with a focus on identifying characteristics of variants. This is followed by six Chapters on Messerschmitt Bf 109 operations over various fronts, including the English Channel, the Eastern Front, the Western Desert, night fighting operations, Defence of the Reich and Training. Next we are treated to seven pages of varied colour side profiles, colour detail walkaround photos, three pages of small but fascinating colour wartime photos, and a description of non-Luftwaffe Bf 109 operators. Chapter 9 is a series of detail drawings and photographs of components from various Bf 109 sub-types, reproduced from original wartime German manuals. These are logically laid out and titled, with helpful English descriptions where they are most needed. The Walkaround section contains wartime photos of several restored Bf 109 Fs and Gs. The book continues with a summary of available models in scales ranging from 1/144 to 1/18. No fewer than than 27 models, built to a very high standard by the author, illustrate the helpful analysis.. This busy title is rounded out with tables summarizing available accessories and conversions, decals, 109 units, airframes and production. Inside the rear cover is a double-A3 width, double sided fold-out sheet of 1/48 scale drawings of the major variants, with scrap views of the important distinguishing characteristics. Drawings include profile, top and bottom plan, and rivet patterns. 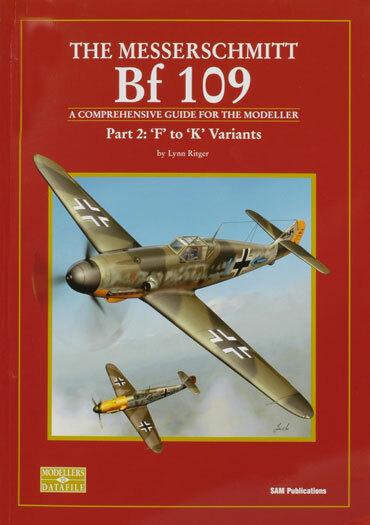 "The Messerschmitt Bf 109 Part 2: F to K Variants" is an ideal modeller's reference for these mid to late variants of the famous Augsburg Eagle. Its 224 pages contain a helpful blend of historical and modelling information, supported with copious wartime photos (well captioned too), technical drawings, colour walkarounds and inspiration via artwork and assembled models. If you have the slightest interest in the Messerschmitt Bf 109, this is one book that should be on your shelves. Thanks to SAM Publications for the review sample.